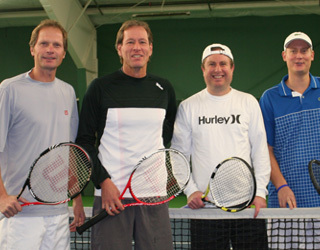 Joachim Nierfeld and Steve Kimoff, above left, beat Greg Johnson and Andy Freeman, on the right, 6-1, 6-4, in the Men's 30 & 35 Doubles final of the Hollyburn Country Club's first seniors tournament, November 10-13. Photo 1 (left): Fifty- three-year old Bob Exell captured the Men's 35 Singles title by beating Manuel Calvo in the final, 5-4 Ret. Good job, Bob! Photo 2: Rick Hunter and his mom, Pam Hunter. Pam, a five time National Champion, singles and doubles, came to watch her son oust top seed Nick Brummelkamp for the Men's 45 Singles title. Rick defeated Nick, 6-3, 1-6, 7-6. Photo 3: Mamood Gouneili of BCTennis.com, left, and tournament director, Rob Fought. Mamood lost to Claude Pierce, 7-5, 6-3 in the Men's 55 Singles. As for Rob, he and his partner Rick Hunter reached the Men's 45 Doubles final, where they lost to the Macken brothers (Pat and Tony), 6-4, 6-2. Photo 4: Claude Pierce and his wife Sylvie Lefebvre. Unseeded Claude lost in the Men's 55 Singles final to the top seed Bob Langford, 3-6, 6-3, 6-0. En route to the final, Claude defeated, No. 2 seed Warren Lore and No. 3 Ken Babcock. Photo 5: Pat Macken, left, and Tony Macken, winners of the Men's 45 Doubles. Photo 6: Warren Lore is ready to serve. Warren lost to Dave Burgess, 6-2, 6-3, in the Men's 55 Consolation final. Photo 8: Jorgen Nielsen, left, and Herschel Hardin. Herschel topped Jorgen, 6-2, 6-0, in the Men's 70 Consolation final. In the Men's 30 Singles: Joel Sida d. Hector Macdonald, 6-1, 6-3, In the Men's 70 Singles: Horst Dammholz d. Ray Kimoto, 6-1, 6-0, In the Women's 35 Singles: Tatiana Petrova d. Christine Lindsay, 7-6, 6-1, In the Women's 55 & 65 Singles: Micheline Berry d. Blanche Cyr, 6-1, 5-7, 6-0, In the Women's 30 & 35 Doubles: Ainge/Fought d. Holloway/Lydon, 6-2, 6-1, In the Women's 45 Doubles: Van Santen/Wills d. Kerluke/Pedlar, 6-3, 6-2, In the Women's 55 & 65 Doubles: Fraser/Rosenbaum d. Berry/Brown, 6-3, 6-3.